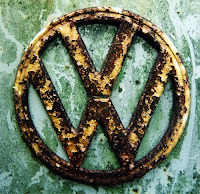 t has been estimated that the cost of corrosion is over one percent of the world's economy. Ninety percent of all mining of metallic ores is for the extraction of iron. As much as twenty-five percent of the annual steel production in the United States goes towards replacement of material that has corroded. And probably most interestingly, over thirty-seven percent of statistics on the Internet do not have a valid reference. Every car guy's arch enemy is corrosion; some days I swear I can hear it. To clean up some corroded parts from my 1973 Super Beetle, I built an electrolytic rust remover. 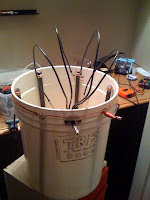 I've affectionately called this apparatus "The Rust Bucket" (or TRB-3000). I can't take credit for its ingenuity - I think I first saw it on instructables.com, and since then multiple postings across the Internet. With this blog entry I just want to add some additional information and describe my design and lessons-learned. Pliers, wire stripper, knife, etc. The construction details really depend on preference, intended use and the size of parts to de-rust. The general concept is to surround the cathode (the rusty item) with electrolyte (a conductive solution) and evenly-spaced anodes. To understand how it works requires some chemistry. The corrosion of iron to iron oxides (rust) is a series of chemical reactions and depends on the amount/presence of oxygen (O2), water (H2O) and available electrons, producing different types of rust (different combinations of Fe and O). Typically the outer layer is known as red rust or hematite (Fe2O3). Under it is a purple-grey material (Fe3O4) known as black rust or magnetite. FeO (wüstite) is another type of rust, but typically only a concern if you are dealing with meteorites or native iron. By adding electrons, the "rust" reaction can be partly reversed. The black rust (which conducts electricity) can be converted back to metallic iron with a good bond to the original metal. The red rust is converted to black rust and becomes detached from the surface. Another thing to consider is that most car parts aren't pure iron - rather, likely some kind of iron alloy, the most common being some type of steel. For the most part, this process will still work although there will be a few more elements (e.g. carbon, nickel) involved and potentially some not-so-nice gases produced. Be careful; don't inhale. Any alloy containing chromium (e.g. 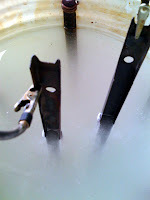 stainless steel) can pollute the solution into a toxic swill - so don't be tempted to use stainless for your anodes. There is no magic in the sodium carbonate (Na2CO3) solution. It acts as the electrolyte, simply carrying the electrons from the cathode to the anode. During the reaction there is no reduction in Na2CO3. There is however some loss in H2O due to ordinary evaporation but mostly due to the break up of the hydrogen and oxygen as it passes the electrons. Some instructions I've read called for washing soda (a.k.a. soda crystals or soda ash) to be used in the solution. However when I tried it, it foamed up like a latte - I'm guessing because of an additive to make it a better soap (I would consider this hydrogen/oxygen foam a bit dangerous). Since then, I've been using pH booster (the stuff used in swimming pools). I use roughly 1 tbsp per gallon (about 3grams/litre). Because the reaction produces hydrogen (and oxygen, and potentially some other gases), I've read a lot about people being fearful of this rig. Granted their visions of the Hindenburg are somewhat justified, but considering how slowly the hydrogen is produced and how quickly it dissipates (when using pH booster, not washing soda), you are not likely to set up an explosion if done outside. Having said that, sparks caused by the power source and smoking should be avoided. As well, when dealing with electricity and a conductive solution, always use your common sense. Another potential negative side effect is hydrogen embrittlement where hydrogen gets diffused through the metal causing it to weaken. This should only be a concern if you are dealing with high-strength steels, which you may not want to try anyway because of the additional metals involved in the alloy. The reaction is most effective with a line-of-sight from the cathode to the anode. Seeing how lazy electrons are, they always try to take the shortest path. Because of this, it helps to periodically reposition the cathode to get multiple angles of exposure to the anode(s). As a bonus, this electrolytic process is effective at removing paint. I found it best to clean the part well, scratch the paint a bit with a wire brush (down to the metal) and after a few hours in the TRB-3000, the paint falls off like a skin. The time required in the bucket differs. Some parts are more intricate and required more repositioning. But on average, anywhere from 2-12 hours does a good job. For safety reasons, I only run it when I can keep an eye on it.